After looking at a range of construction options we settled on a timber frame wall system using factory-assembled panels. These Structured Insulated Panels come with door & window openings already in place, insulation inside and are bolted onto the foundations. The whole house frame is assembled on site in less than a week helping to speed the build to completion. 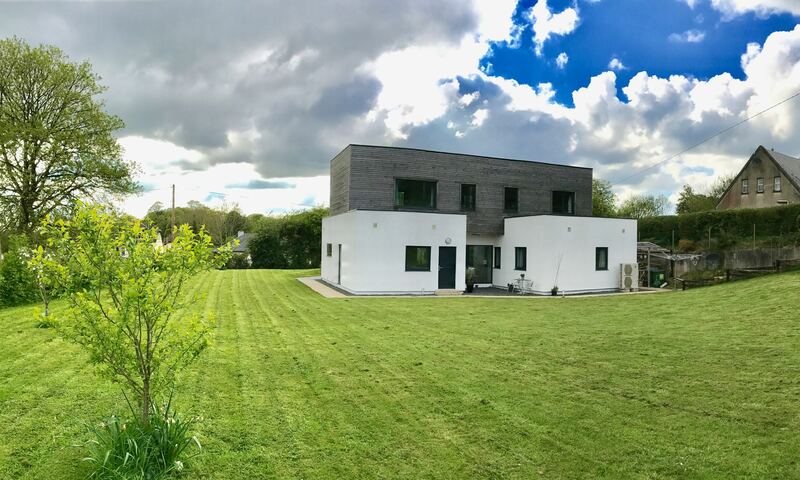 There are several other advantages to the SIP system including very precise and accurate construction, high insulation values, high airtightness and slim wall profiles. We chose the Kingspan Century Ultima wall system after much deliberation. There are a small number of Irish suppliers of SIP systems and all offer a good product but the Kingspan package won on a combination of cost and features in the overall package. 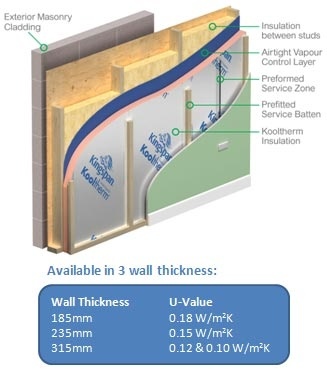 The Ultima Wall SIP system combines an insulated timber panel with airtightness membrane and high performance insulation on the inner face and a battened service cavity which is enclosed in plasterboard after all the trades have done their pipe work and wiring.